Donation requests are made by charitable organizations working to serve the underprivileged. There are many non-profit organizations that work alongside the government helping the needy and poor. However, all development work such as education, health, shelter, and food require finance. In order to generate funds to carry out such work, these organizations require donations. Donations may be collected from government bodies, corporations, trust funds, civil society, and certain individuals. 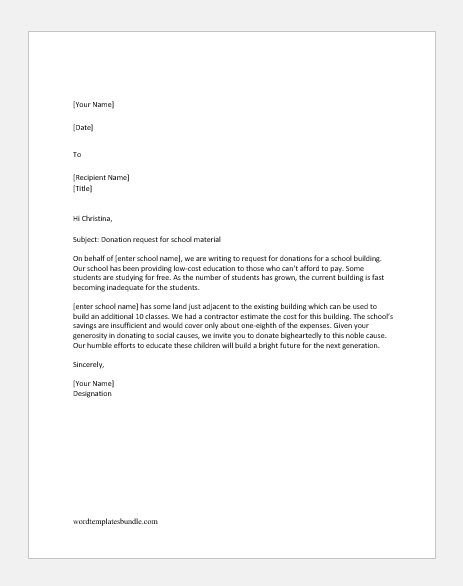 On behalf of [enter school name], we are writing to request for donations for a school building. Our school has been providing low-cost education to those who can’t afford to pay. Some students are studying for free. As the number of students has grown, the current building is fast becoming inadequate for the students. [enter school name] has some land just adjacent to the existing building which can be used to build an additional 10 classes. We had a contractor estimate the cost for this building. The school’s savings are insufficient and would cover only about one-eighth of the expenses. Given your generosity in donating to social causes, we invite you to donate bigheartedly to this noble cause. Our humble efforts to educate these children will build a bright future for the next generation. This is to invite you to donate for a noble cause. We at [enter school name] provide low-cost education to the poor. Our school is managed by a non-profit organization that seeks to provide an opportunity for deserving students to educate themselves. The school primarily runs through donations from people and organizations like you. In order to support poor students and provide them with a good environment, the school places special emphasis on school material. This includes providing students notebooks, stationary, equipping the classes with furniture, stationery, and art materials. Teachers are directed to make their classes interesting in order to attract student’s interest. This year, the school requires almost Dollar two thousand for school materials. We hope you contribute to the future of young people. Your humble donations will go a long way to make a difference in the lives of some children. 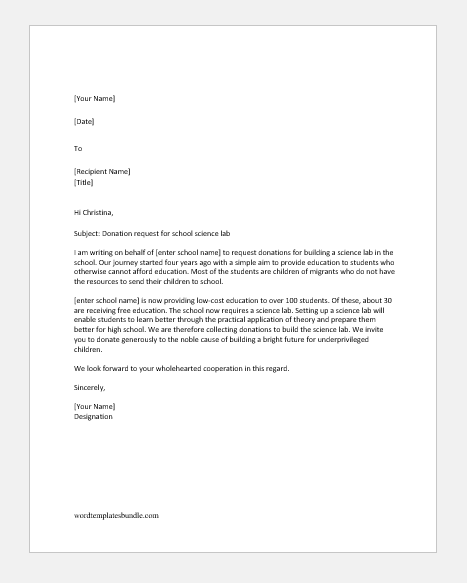 I am writing on behalf of [enter school name] to request donations for building a science lab in the school. Our journey started four years ago with a simple aim to provide education to students who otherwise cannot afford education. Most of the students are children of migrants who do not have the resources to send their children to school. [enter school name] is now providing low-cost education to over 100 students. Of these, about 30 are receiving free education. The school now requires a science lab. Setting up a science lab will enable students to learn better through the practical application of theory and prepare them better for high school. We are therefore collecting donations to build the science lab. We invite you to donate generously to the noble cause of building a bright future for underprivileged children. We look forward to your wholehearted cooperation in this regard. 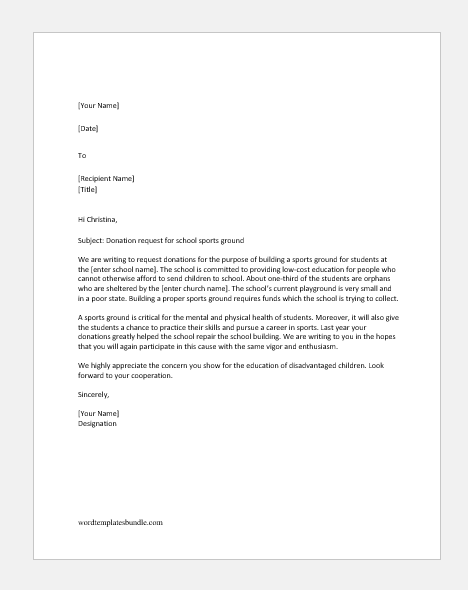 We are writing to request donations for the purpose of building a sports ground for students at the [enter school name]. The school is committed to providing low-cost education for people who cannot otherwise afford to send children to school. About one-third of the students are orphans who are sheltered by the [enter church name]. The school’s current playground is very small and in a poor state. Building a proper sports ground requires funds which the school is trying to collect. A sports ground is critical for the mental and physical health of students. Moreover, it will also give the students a chance to practice their skills and pursue a career in sports. Last year your donations greatly helped the school repair the school building. We are writing to you in the hopes that you will again participate in this cause with the same vigor and enthusiasm. 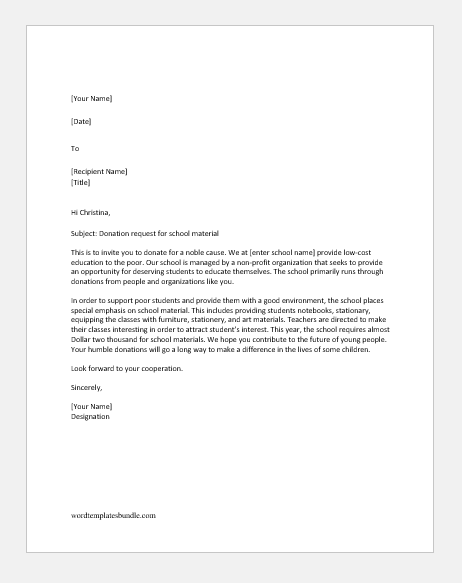 We highly appreciate the concern you show for the education of disadvantaged children. Look forward to your cooperation.